Photinia Fraseri Red Robin Robusta Compacta is a new variety of Red Robin, it is in between the traditional Red Robin and the Little Red Robin. It has smaller leaves than the Red Robin but is a much more compact variety than the Little Red Robin, which if left uncut tends to get a bit loose in nature. 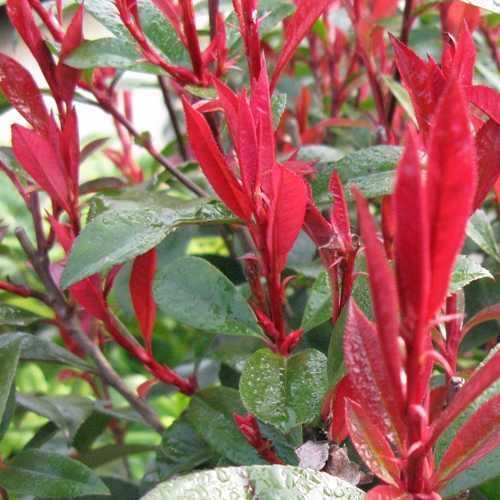 It is an evergreen shrub, in the Spring the new leaves emerge as a bright red and then gradually fade through the season to green. If the shrub is regularly trimmed it will gve you a very nice, dense, interesting hedge.